These easy, healthy, and delicious Baked Spring Pea and Dill Fritters with Lemon Tahini Sauce make a great gluten-free & vegan appetizer, snack, or meal! Healthy Gluten-Free & Vegan Baked Pea Fritters with a touch of garlic and dill served alongside a creamy and delicious Lemon Tahini Sauce . . .
Fritters are a staple in our household. Whether baked or pan-fried, fritters are versatile and great for little hands to hold and eat (a plus for us!). I created these delicious baked fritters in the spirit of Spring . . . If you're looking for a filling appetizer, snack or meal that is healthy AND delicious, look no further. 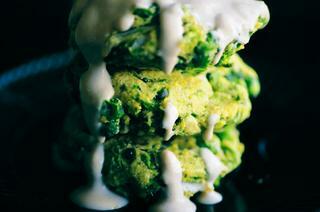 These Spring Pea Fritters w/ Lemon Tahini Sauce fit the bill and more! Preheat oven to 400 F. Line a cookie sheet with parchment paper and drizzle with olive oil; set aside.In large mixing bowl combine all fritter ingredients (peas through garlic powder). Mix and mash until evenly combined.Form batter into approximately 10 fritter patties. Place on prepared cookie sheet.Bake for 12 minutes. Flip each fritter. Bake for 12 minutes longer.While fritters are baking, combine all tahini sauce ingredients in a bowl and whisk until smooth.Let fritters cool before serving alongside lemon tahini sauce.Enjoy!